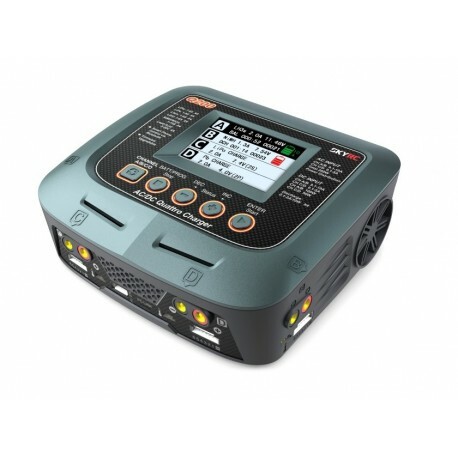 The four-channel SKY RC Q200 2x100W + 2x50W charger has been designed to provide everything you need to charge up to four batteries at the same time "under one roof", including a lightweight, easy-to-use power source. 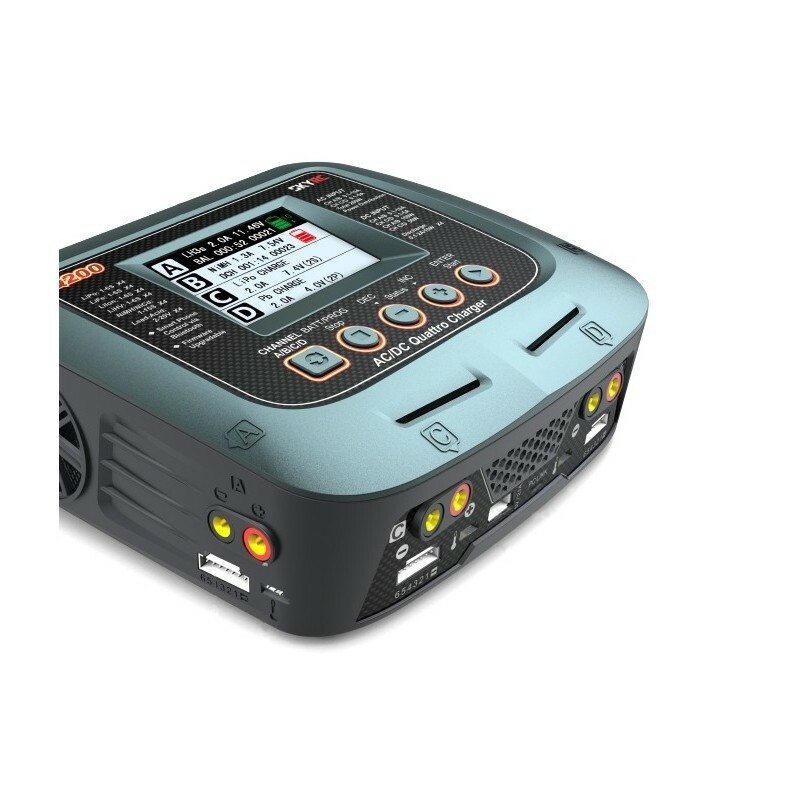 The Q200 allows you to charge and discharge common cell types (NiCd, NiMH, Li-Poly, Li-Ion, Li-Fe, Li-HV, Pb). 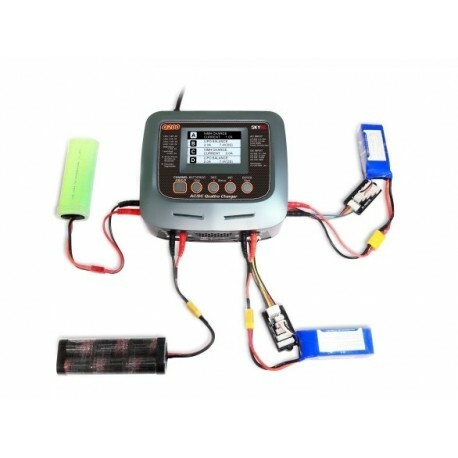 All the channels are equipped with built-in six-channel balancers for very safe and comfortable charging of lithium batteries . Lithium and Pb accumulators are charged using the "Constant Current / Constant Voltage"
End charging when the set time, charge charge or cut-off temperature is exceeded. Memory for 10 charging / discharging programs for each channel. Two fans for forced cooling. The charger is equipped with a JST-XH service jack on both channels, the adapters for the JST-XH system are included with the charger kit. You can purchase a temperature sensor to measure the temperature of the charged / discharged batteries. 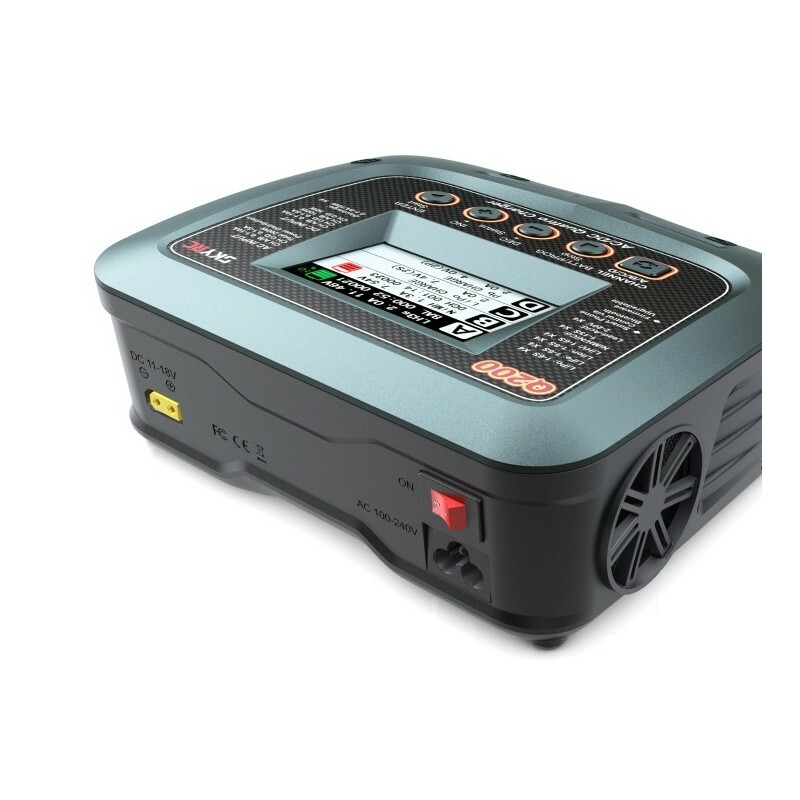 Note: When charging lead-acid accumulators, the charger uses a terminal voltage of 2.40 V / cell - this is why it is suitable for charging classic lead-acid batteries and rechargeable gel batteries. 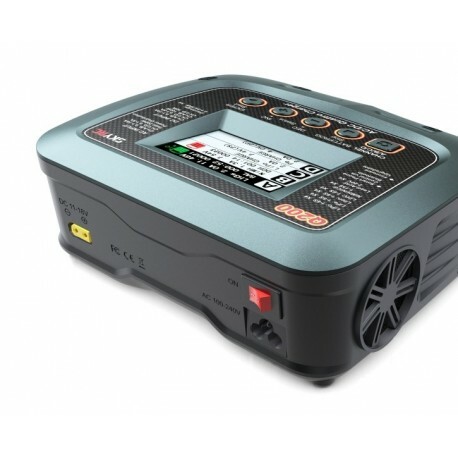 To charge gas-tight gel batteries that can not be charged at more than 2.30 V / cell, do not fit. 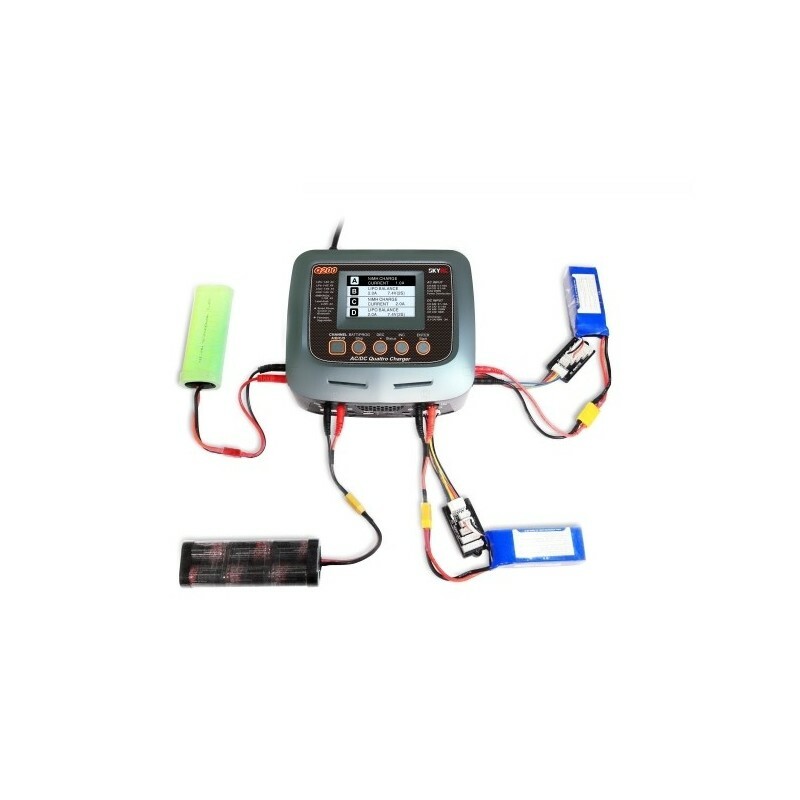 The charger kit includes: Q200 charger, power cord, 4x charging / supply cable 12V 4mm banana / XT60, 2x 4mm charging cable for bananas / free ends, 4x JST-XH lithium (2-6s) instructions. Tip: You can easily update to the latest version of the Q200 by updating the firmware." 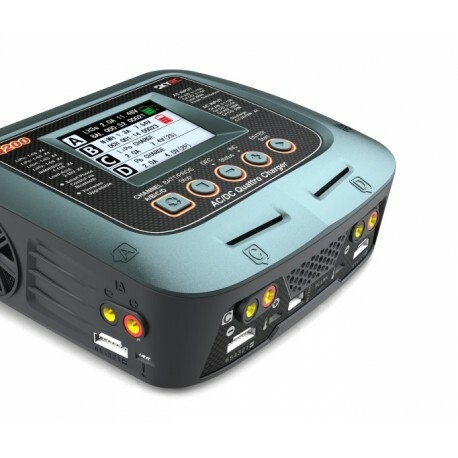 In the "Download" section, you will find an appendix to the instructions for charging with SkyCharger, "SCAN TO GO", firmware update, and other useful information.